In the eyes of Native Americans that I grew up with in rural Oregon, we are all living on a reservation of sorts, even though the psychological borders and fences tend to escape our attention. If we can’t see the forest for the trees, how are we supposed to see the prison for the bars? A willingness to assess our lot in life can involve more than our personal wants and needs; it can involve more than even the needs of our race or our planet. The entire matrix of our shared sense reality is worth examining and evaluating. We all leave literal, and symbolic, footprints on earth. Are yours helping the planet to be a better place? As Russell Means says, “The Reservation” isn’t necessarily a physical locale. It’s also psychological. Any time the mass media, academia, or governments try really hard to convince you to think a certain way, especially when it involves sacrificing your personal freedoms, it’s worth being suspicious. Most people have the ability to think for themselves. Exercising this ability is true freedom. When the mass media, Hollywood, the world’s most powerful governments, and academia all agree that a policy or concept is vital and requires radical changes to implement, be VERY suspicious. 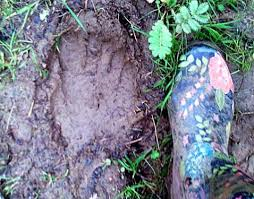 This entry was posted on Thursday, May 15th, 2014 at 3:31 pm and is filed under Bigfoot, Books, Folklore, Footprint Evidence, Kultus, Pop Culture, Sasquatch. You can follow responses via our RSS 2.0 feed. You can skip to the end and leave a response. Pinging is not allowed. I’ve recommended this video to everyone I know. We miss you, Russell! “Americans are the new Indians”.